Codes of Conduct & Conduct Committees – 11th Principle: Consent! 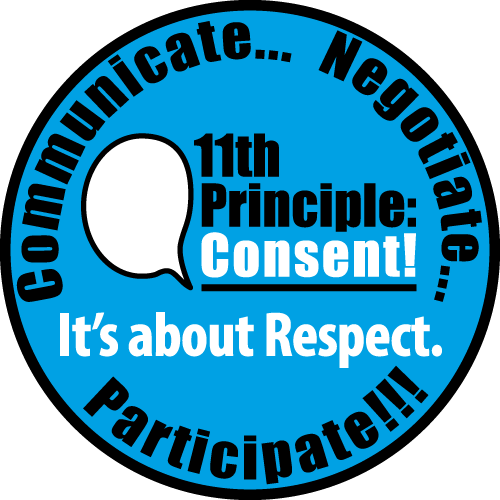 The 11th Principle: Consent is primarily an awareness and education effort. And, as we all know, principles are not rules. While we have shifted burn culture through the conversation around consent, the real teeth in protecting our communities comes from Codes of Conduct & Conduct Committees. Note that it’s common for reports to increase after the implementation of a Consent Initiative, Code of Conduct, and/or Conduct Committee. It may seem like a bad thing, but it’s exactly the point and usually reduces once the community gets on board with enthusiastic consent culture. Just think, you’ll be giving some people a voice for the first time and saying “Yes, we take this seriously, we care, and we are going to do something about it” to your community. In general, pARTicipants report a greater feeling of safety because of an event’s prioritization of consent culture along with the implementation of a Code of Conduct and Conduct Committee. We feel that, at minimum, every burn should have a Code of Conduct with defined way to report consent and conduct violations. Consent education is not enough. Some Theme Camps, especially those at BRC, also implement their own Codes of Conduct, which is a great way to prioritize Consent! Also check out the 11th Principle Consent Theme Camp Liaison Guide from Transformus to get some ideas.